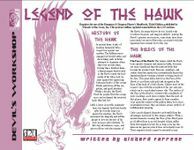 To this day, adventurers, sages, and grave robbers seek the remains of the Hawk, for many believe he was buried with wondrous treasures and magical artifacts. Among the Hawk's precious possessions, some items have been uncovered, but most of the relics associated with this legendary hero remain lost to this day. This four-page Weapons and Equipment PDF is easy-to-integrate and just the sort of thing needed for DMs to add depth to any great d20 fantasy campaign world and gaming session.